This "Historically Speaking" column was published in the Exeter News-Letter on Friday, March 1, 2019. “Windmill Street” sounds like the kind of name favored by out-of-town developers. To be clear, there is no Windmill Street in the town of Exeter, New Hampshire, and according to all the records there hasn’t been one in the past. And yet, on an 1896 map of the town there is a Windmill Street just off Park Street – clearly labeled. Its existence on paper is due to a very particular art form that flourished in the late nineteenth century known as the bird’s eye map. Bird’s-eye maps are not designed to find your way around town. They are meant to be a visual story about a community, and as such, they are created by an artist rather than a cartographer. In them, the factories are always shown with chimneys belching smoke into the air. The waterways are filled with boats. If the town has a railroad depot, there will always be a train chugging its way into the picture. It isn’t “Exeter, New Hampshire” it’s “EXETER, NEW HAMPSHIRE! !” Not some little backwater town with a boys’ school, but a lively community. Exeter was lucky enough to be the subject of two bird’s-eye maps. The first, made in 1884, was produced by Norris & Wellge of Brockton, Massachusetts. The Exeter News-Letter mentioned Norris’s visit in October and said of the early sketches, “It is the most interesting representation of a town that we have seen.” Adding that, “The view shows distinctly all the houses, churches and other objects in town so faithfully that they may be easily recognized.” To produce a map of this kind, an artist would walk the town roads, sketching the buildings and scenes. Later, the sketches would be added to a basic road layout from a perspective that appeared to hover over the town. The accuracy of the map would depend on the skills of the artist. German-born Henry Wellge was up to the task in 1884. Sketches were made in the fall, one of the most attractive times of year in New England. Phillips Exeter Academy and the Robinson Female Seminary are both prominent features in a town that has always been proud of its academic atmosphere. The bustling west end of town – clustered around the Boston and Maine depot – depicts a community prospering with post-Civil War growth. Schooners make their way up the Squamscott River with no indication that they needed to be towed through the unnavigable ox-bow. Leisurely canoeists are seen on the Exeter River and Phillips Exeter school boys can be seen playing tennis on the Academy lawn. Townspeople eagerly purchased the full sized map for $2.00 and sent the 25 cent smaller version to relatives. In 1896, another publisher, A.W. 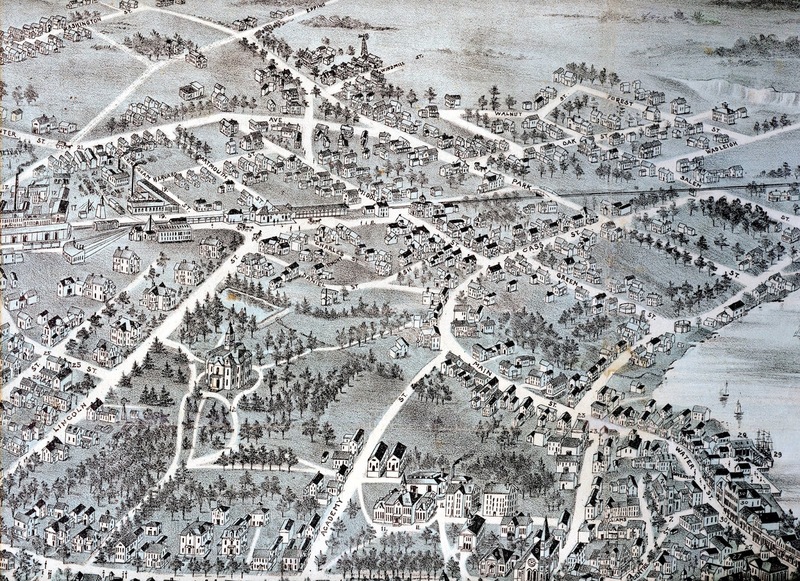 Moore Company of Boston, Massachusetts, produced an updated bird’s-eye map – larger than the previous map. “A very pretty birds eye view is being published in two colors, on plate paper, size 24 x 38, containing correct view of town with marginal of churches, public buildings, schools and academy, as well as factories and building blocks,” read a notice in the Exeter News-Letter. The new map sold for $1.00. Surrounding the map was a series of ‘vignettes’ of local businesses and public buildings. No doubt the businesses paid for the advertising space. The town is similar to that of 1884, although there are more people on the downtown streets and the entire west end of town – the industrial part of town – has been moved forward from the horizon to bring the area into view. Like the previous map, the 1896 bird’s-eye sold well. 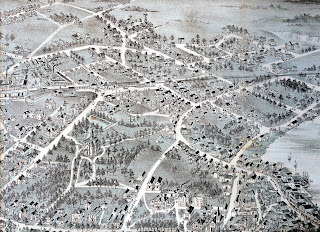 There are numerous copies of both maps in the collections of the Exeter Historical Society. Nearly hidden at the top of the map is a view, with the proportions of necessity distorted just a bit, of the area surrounding Park Street Common. Peeking out is a newly laid street – so new it still did not have a name in land deeds of the same year. With all the other streets carefully labeled, what was the publisher to do with a no-name street? Two years previous, the Exeter News-Letter reported, “Messrs. Nealey & Wadleigh have erected a large windmill at the spring on the Judge Smith place, with a tank to hold 5,000 gallons.” The publishers included the windmill on the map and grasping for a name for the street, labeled it “Windmill Street” most likely because, although not an official name, it was how people talked about it. Within four years, “Windmill Street” would become Locust Street. At roughly the same time, Exeter Water Works extended water and sewer lines and the windmill was no longer needed. At some point, it was taken down. The 1896 bird’s-eye map is our only source for the mysterious “Windmill Street” in Exeter. Image: Detail from the 1896 Bird’s-Eye Map of Exeter. Phillips Exeter Academy and the Robinson Female Seminary can both be seen. “Windmill Street” can be found at the very top.